When you live in a mid-gentrification neighborhood like the Junction, brown paper in storefront windows, "For Rent" signs, or any other indication that a new business is opening are constant sources of nervous anticipation - Will it be something cool, or just another crappy junk shop? A couple of weeks ago, a new cafe opened in the area that definitely fits into the former category, and not by name only. Cool Hand of a Girl (2804 Dundas Street W) is a new organic cafe located just east of Keele on Dundas; Dave and I headed down there this past weekend to check it out. My first impression was that this coffee shop is really cute: it occupies a small space, and the tables and chairs are a mish-mash of fun retro furniture. The walls are currently bare except for a cool black and white art installation on one wall - I expect more art will be added soon, making the space feel less "plain" than it does now. Stepping up to the counter to order, Dave and I had a look at the short blackboard menu on the wall. Cool Hand of a Girl serves a small selection of soups, salads, sandwiches, and desserts along with its organic coffees and herbal teas - I decided on the tamari-balsamic baked tofu sandwich, and Dave opted for an avocado, cheddar, and chutney sandwich with a side house salad. We also ordered some of the house-made iced tea - ginger green tea for me, and hibiscus, rosehip, mint tea for Dave. We grabbed a seat to wait for our food, and sipped at our ice teas. Wow - All I can say is that these were the best tasting glasses of iced tea that I have ever experienced. Perfectly sweetened, each tea was a refreshing blend of complex flavours. Mine had a nice bite from the ginger, and Dave's had a slight fruity flavour that was offset by the soothing mint. I could drink these iced teas all day long. Once our minds were thoroughly blown by the iced tea, our sandwiches arrived. 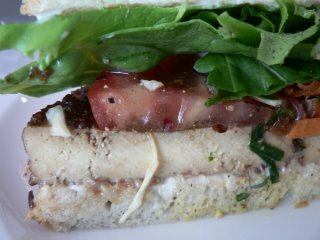 Served on fresh, lightly- toasted multigrain, mine was host to a huge slab of marinated, baked tofu, fresh greens, tomato, and mayo. The tofu tasted divine, with a slight undertone of cinnamon or allspice, and the mayo provided a perfect creamy foil. Dave agreed that the mayo was "fluffy," with almost a whipped texture, and I suspect that it is house-made. I was in sandwich heaven. Dave similarly enjoyed his sandwich, and the bite he gave me proved it to be a tasty combo of creamy avocado and sharp cheddar, with a subtle touch of chutney. He also shared his side salad with me, which was amazing and definitely unique. The salad contained a healthy dose of sunflower seeds, fresh herbs, cabbage, shredded carrots, tiny cherry tomatoes, and fresh greens in a beautiful, complicated vinaigrette. Thoroughly impressed with this new addition to our neighborhood, we decided to try some of the homemade banana cake for dessert. It was kind of dry, but the addition of dates and chocolate chips made for an interesting finish to our meal. While the cake came up a little short, there were lots of other desserts on display for us to try next time we visit. The service at Cool Hand of a Girl is friendly and very attentive for a place where you order at the counter - two glasses of water with lemons were brought out with our dessert, without us having to ask for them. Currently, this cafe does not serve breakfast or dinner (they close at 4), but I hope they expand their menu soon - I'd love to see what tasty and imaginitive dishes they'd come up with. 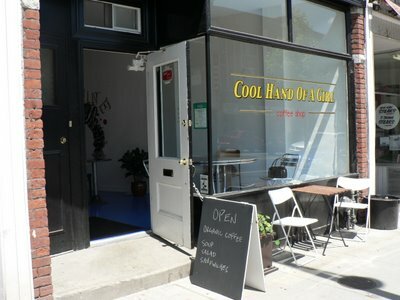 I highly recommend Cool Hand of Girl, and I can only hope that it's an indication of things to come in the Junction. Maybe it's just because I haven't made breakfast yet, but damn. Suddenly I want to be a lady that lunches--in the junction, no less. So what you're saying is that you'd like to have a gastric function in the Junction. That has got to be one of the coolest names ever for a restaurant. I heard from High Park neighbourhood gay friends that's a great place to hang and worth a visit or three. I also heard on the grapevine that the they own a similar place at Queen and Roncesvalles. When the weather gets a bit better for cycling, I will have to go up, and do a review of Cool Hand for a Girl Cafe for our Queer West Village website. get out of here, celia! looking forward to visiting Cool Hand of a Girl.. I live in the Junction and go to Cool Hand of a Girl almost every weekend for their Coleslaw-Avocado salad, but I think it's time to find a different weekend morning haunt. Actually. The worst thing about CHOAG is the service. I have sat there for a meal about a dozen times now, and I have yet to see either one of the ladies or the hippie dude show a hint of a smile. I've seen them occasionally cordial with other customers, so it's in the realm of possibility. Even the cafe place on the other side of the Dundas-Keele, the one with internet backrooms, no savoury food to speak of, and much shabbier clientele, has much kinder staff. I've set foot there exactly three times, to get a coffee and run, and the staff ladies -- that look like characters from a Mike Leigh movie -- were always warm. It's also very difficult to find any information about Cool Hand anywhere. They're not in Yellow Pages, and the only sign of them on the internet is this blog and another one. Can't they start a restaurant blog or something, or get themselves into phone books? And what is with 9-4 hours? Honestly: it's like they're not too keen on having customers. Maybe if you weren't so grumpy and uptight you'd get smile from the staff. Thank god for CHoaG. oooh thanks for this review! i keep hearing about this place, and considering i live at keele/annette it's shameful that i still haven't been. i might head over right NOW actually! sadly i've gone six times in the past two months (on weekends, when they claim to be open) and the resto was closed. a couple of the times there was a handwritten sign that said "sorry, we're closed this weekend, will reopen next weekend" (which was untrue) and the other times there was no note, yet it was still closed (despite the opening hours). disappointing to say the least! thankfully i live closeby so it wasn't as big of a waste of time as it could have been. I've eaten there twice and really enjoyed my tea, sandwich and House-made coleslaw. My husband's lunch was superb also; very fresh and 'clean tasting', if that make sense. We were a little unsure of the service as there was no signage re: 'sit and wait to be served' or 'order then sit', so we sat for 5-7 minutes before realizing we had to go up and order and we were the only people in there with 3 people behind the counter. They could have SAID something to us. Otherwise, we really enjoyed the whole experience. I'm anxious to try The Beet and The Sweet Potato, both on Dundas west of Keele on the south side and organic. Well they were just re-opened by new, very friendly owners and I think they're using the same menu. The name is at least the same. The hours of operation are way better now too, as apposed to just weekends. It's great 2 read all of the comments given here.Sounds like this place needs a new face! !I'm a chef who is looking 2 change his nights 2 day's...The fun part is im able 2 control not only the front of the house but as well creating new and bursting taste buds w/ my creations in the kitchen... I will go down there and see what is needed?! chef Jagger. I have been there several times... always great food...service a bit sparce, but they're busy and trying hard. Everything has been fresh. My favourite is the Mennonite chicken salad sandwich on multigrain soft bread with a hint of curry. SO tasty. Going there again today, August civic holiday but couldn't find it in the yellow pages to confirm that they are open. Checked the net and there they are... with a phone number even! The wave of the future! When you live in a mid-gentrification neighborhood like the sportsbook Junction, brown paper in storefront windows, "For Rent" signs, or any other indication that a new business is opening are constant sources of nervous anticipation - Will it be something cool, or just another crappy junk shop? A couple of weeks ago, bet nfl a new cafe opened in the area that definitely fits into the former category, and not by name only. Cool Hand of a Girl (2804 Dundas Street W) is a new organic cafe located just east of Keele on Dundas; Dave and I headed down there this past weekend to check it out. sportsbook My first impression was that this coffee shop is really cute: it occupies a small space, and the tables and chairs are a mish-mash of fun retro furniture. The walls are currently bare except for a cool black and white art installation on one wall - I expect more art will be added soon, http://www.enterbet.com making the space feel less "plain" than it does now. Cool Hand of a Girl is the kind of cafe I wish would pop up in my neighborhood. Small but delicious menu of soups, sandwiches and salads and desserts.Costa rica toursOrganic coffee and tea. This place gets busy.